The abstract atmospheric creations of Colombian artist Carlos Jacanamijoy combine the personal lush experiences of a Shaman’s son - sensitized to the colors, organic forms and sounds of an Amazonian rainforest - with the vibrant cultural heritage of the Ingas people to whom he belongs. 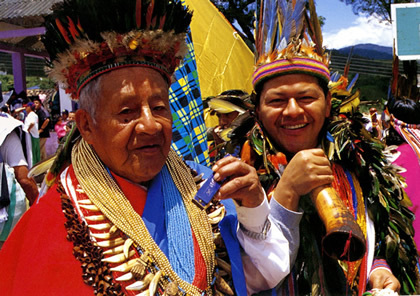 The Ingas are one of numerous communities that once formed part of the great Inca Empire. A particular feature of this community is their tradition of persistent exploration in the pursuit of knowledge and their long association with indigenous peoples of adjacent territories. The special talent of Jacanamijoy is to absorb this heritage and transform it into an outstanding artistic statement about the essentiality of natural beauty. This is achieved due to Jacanamijoy’s tremendous technical capability in oil painting. These paintings give intimations of a portal from the primitive unconscious world of yesterday, once referred to as the “anima mundi” or “World Soul”, pulsing in space as it opens and expands toward the technological future of the viewer. In this future, the artist will prove himself to be one of the outstanding artistic figures of our time. Jacanamijoy was born in 1964 and lived with his family until 1982, when he began at 18 to study fine art, painting, philosophy and literature. Eduardo Serrano Rueda, Director of The Arts Section of the Colombian Ministry of Culture, writes, “ …It is evident that Jacanamijoy’s original works embrace both nature and the heritage of his ancestors…” Clearly Jacanamijoy is drawn to the mythic structures of the indigenous peoples of Colombia. This commitment to the spiritual essence of the Ingas transmutes his paintings and drawings into an unknown territory of the mind: A plush Amazonian space suffused with slowly moving, multicolored shapes that imply flying insects, flowering plants or birds. These entrancing images of the portal exist between our waking and dreaming selves. This illusionistic space can advance or recede toward the viewer. His poetic vision is motivated by the artist’s real link to his culture as pre-European and Pre-Christian, without being hostile to Christian views. His is an aesthetic sensibility shaped by the values, colors, textures, and theories of the cosmos articulated by the Incas, whose astronomical system is in contrast to western thought on the origins of the universe. The late Philosopher Jose Arguelles, who studied the Mayan calendar, suggested the thirteen-moon Mayan calendar is far more accurate than the European Gregorian time line. The great preoccupation of the Mayans was the constant elaboration of their calendar and astronomy in general. They have been called the Greeks of the New World. The high point of Mayan culture ended about 1525. Before that time they controlled a vast area, from the Yucatan in the north to Honduras in the south. The Incas, on the other hand, began their Imperial Reign between 1438-63 when they conquered all of the Southern Highlands of Peru. 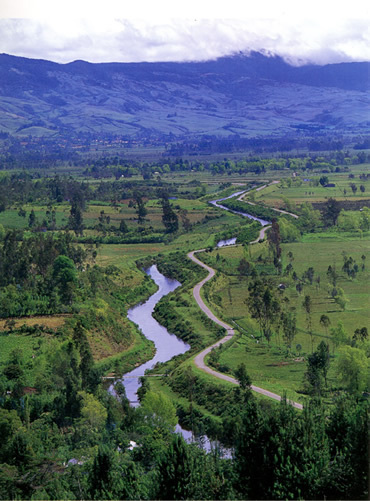 In the reign of Tupac Yupanqui (c. 1471-93), the Inca Empire stretched from Ecuador to the Maule River, in Chile. The connection between these two very different peoples and histories is in their relation to time. Jacanamijoy’s sense of time is emotional, plastic and less linear than the Eurocentric concept of time and motion. It is this that gives his painting and drawing its metaphysical authenticity. With these cultural differences in mind, it becomes clear that the fundamental force of Jacanamijoy’s art comes about through the animistic positivism and aesthetic sophistication of his culture. Animism is the belief that all natural objects such as rivers and rocks possess a soul, while Positivists usually hold that all meaningful statements must be either logical inferences or sense descriptions. Objectively speaking, the Ingas would qualify on both these counts. 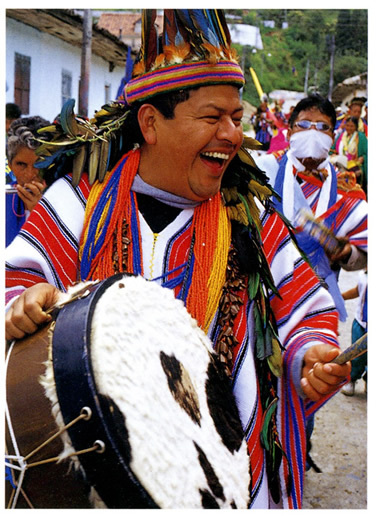 It is well to remember that they are an ancient people populating the Valley of Sibunday, in the Department of Putumayo in southern Colombia, since the late 15th or early 16th century. There is a history of traditional art and a history of modern art. In Jacanamijoy’s case, traditional art can be equated with mid-century European Modernism, particularly the Ecole de Paris. Within this aesthetic, the artist has added his own exotic color, shadows and enclosed Amazonian spaces. He has created blue-green, green, purple, yellow and orange, ambiguously scaled spaces filled with bright to dimming light passing over vibrating life. To some degree the artist’s buzzing topography of the mind derives from Surrealist and Tachiste painters: in the first instance Yves Tanguy and in the second Alfred Manessier. In different ways both painters, like Jacanamijoy, are concerned with the spiritual life of the individual rather than with the representation of the external world. The composer Heitor Villa-Lobos in his majestic, sweeping and romantic “Bachianas Brasileiras” conjures up the vastness and spirituality of the Brazilian rainforest. Jacanamijoy’s appropriation of a number of mid-century painterly devices and aesthetics has correspondences with other contemporary painters working within Post-Modernism. His contribution to Post-Modernism, however, is in inventing new color patterns and biomorphic forms through his original and nuanced use of action painting techniques like the Tachiste painter Manessier mentioned earlier. In this Post-Modern era no particular style or subject matter can be definitive of art, because there is always more contemporary evidence to undermine it. In this present context, authentic art - like Jacanamijoy’s - can absorb into itself new currents in advanced painting because it is sure of its spiritual authenticity and graphic strength. Jacanamijoy’s art is centered on a real visceral knowledge of its subject matter. The painter is well aware that the Amazonian rainforest contains 50% of the world’s plants, animals and insects, as well as being correctly called the lungs of the earth. Jacanamijoy’s art is a syncretism of New World spirituality, saturated color, fluid organic design and a historical understanding of mid-century non-Euclidian spatial poetics. He has created a place where the sympathetic observer can follow the mind’s journey back upon itself.